Dan Zettwoch is back! 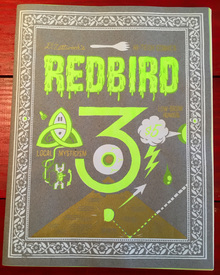 Redbird #3 is a handmade wonder! Begininning with a hand-screened cover in white, gold and radioactive green inks, this 32-page, magazine-size collection is packed with Zettwochiana. Starting off with the story designed to integrate theboyinto the man, "Clint J Murgatroyd presents Famous Places I Have Puked" is 8-pages of gut-wrenching action that finishes of with a "Puke-tographic Map", likely the first of its kind in the annals of comics. This is followed by "Communications Workers of America," which can be profitably read as a follow-up of sorts to Zettwoch's amazing Tel-Tales, a pair of Red Fall appendi, "The Legend of Forky!" centerfold, the Zettwoch-o-gram-atic "Motor Lodge Creek! ", "Lessons I Learned at the State Fair", and closes with what we are informed is but the first installment of "Famous Sorts Which I Invented* (brought to us by Krystal Jackson) *me and my family and neighbors" -- but not before also sharing a classic fromthe Zettwoch vaults, "Mid5outh Miracle5!" All for a fiver! How?! ?